Move over Sid and Nancy. Free form rock is the new black and Brooklyn, New York do-gooders Jen and Johnny from Shellshag are the ultimate musical couple. 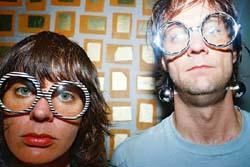 Years ago while performing in separate bands, they were involved with a public arts warehouse and living experiment in San Francisco called Starcleaners. Fast forward to present day, where Starcleaners has become a haven for the artistic community, releasing limited edition music including Shellshag’s first full-length album, Destroy Me I’m Yours. For a band that has performed at buzz-festivals like CMJ and SxSW and boasts a high-energy live show, there really isn’t anything lost in translation on this recording. Released on 12” vinyl with a CD included for those who refuse to part with their iTunes, Destroy Me I’m Yours encompasses all of the garage-rock glory of the duo’s influences, Sonic Youth and Pavement. For what this release lacks in instrumental complexity due to the pair’s duo status (think White Stripes and Jucifer), they make up in personality and execution. Guitarist, Johnny tends to take the microphone on the album’s grinding sludge-punk tracks like “Shut Up” and “123,” while drummer Jen steps forward on minimal, pubescent sloppy-pop numbers like “Magnet” and “Make Love.” Charmingly off-key and occasionally spastic, Destroy Me I’m Yours will motivate you to drop by your local indie dive bar to see Shellshag in action.